Today I will discuss how to install Apache Spark onto a Windows machine. I have just walked through the process a second time at work due to a laptop swap and it takes me some time to remember all the steps to get the install right, so I thought I would document the process. First you will need to download Spark, which comes with the package for SparkR. Note, as of this posting, the SparkR package was removed from CRAN, so you can only get SparkR from the Apache website. Spark can be downloaded directly from Apache here. I downloaded Spark 2.3.0 Pre-built for Apache Hadoop 2.7 and later. After downloading, save the zipped file to a directory of choice, and then unzip the file. I have an Apps (“C:\Apps”) folder where I put all the software that I download and install. This make it easy to transition to another laptop as all I have to do is go down the list installing software. I changed/shortened the Spark folder name for simplicity and ease of typing. As of this writing, Java 9 (I haven’t test Java 10) has been having a ton of issues and is not stable. I was able to use the most recent version of Java 8. You can download the most recent version for Windows at this link. You have to accept their license agreement before downloading. Unlike Spark, I will let the system determine where to install Java. I feel like this works best to reduce future issues. When you install Java, pay attention to the folder location of the installation. You will need to know this path to create the JAVA_HOME environmental variable. This step tripped me up for a long time when I first started learning about Spark. Not many blog posts would talk about installing this software. I am not really sure what it does, but if you want more information here is the ApacheWiki. 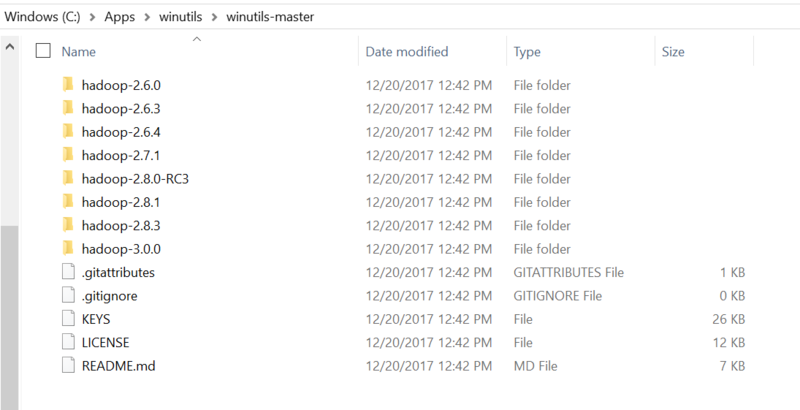 You can download the winutils software from the github repo here. Click on the green button (“clone or download”) on the upper right of the page and download the zip file. I would put this in your “C:Apps\winutils” folder so you can reference it easily (you will need it later). Extract all the files to this location using decompression software like PeaZip or WinZip. PeaZip is free and open source. NOTE: if you decide to set the environmental variables through R, you need to remember that it does not change them on your machine, nor does it flow through to the next session unless they are establish in your .Renviron script. The code to do it in R is below, however, I will discuss setting up on your machine next. The process to set up the environmental variables on your machine will be similar for Spark as it is for the other variables below, where you provide a variable name, variable value and add it to the Path variable. So I will use Spark as a example that you can apply to the other variables. Locate the master or top level file path for the Spark version you downloaded to add to your environmental list. 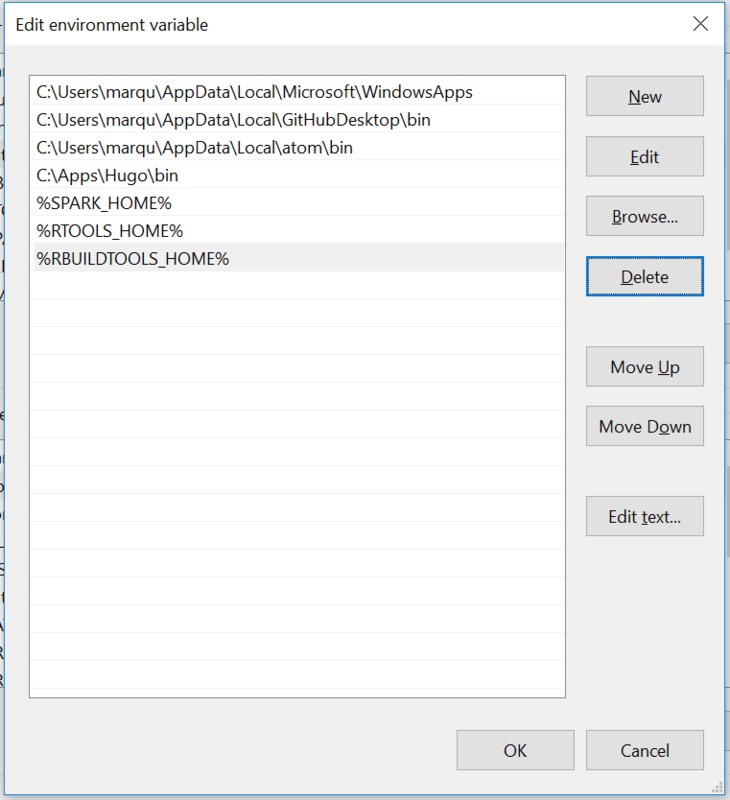 For Spark, the path is in my “C:\Apps” folder, or “C:\Apps\Apache\Spark\spark-2.3.0\”, copy the file path using ctrl + c.
To locate your environmental variables On Windows 10, you can type “environmental” into the search bar at the bottom of you screen, then click on “edit system variables,” and click on the icon that says environmental variables at the bottom. 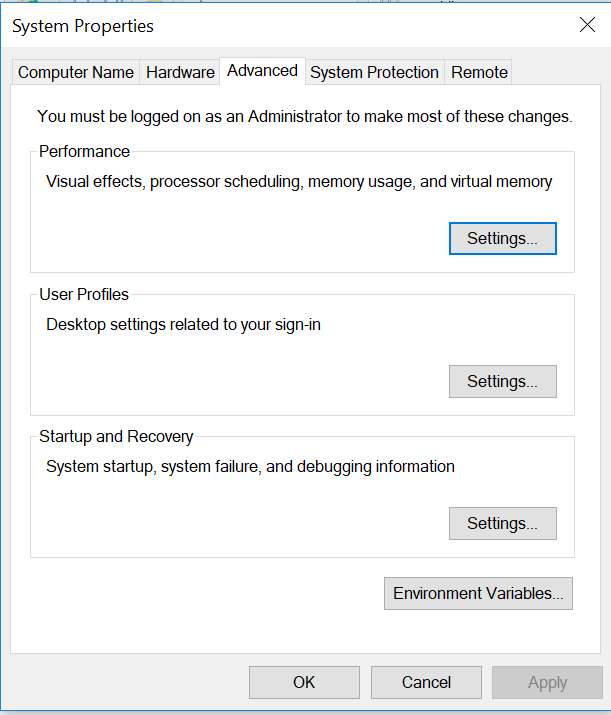 On previous versions of Windows, click on the start menu, right click on computer or control panel, select properties and click on the icon that says “environmental variables”" at the bottom. Next, add a new variable by clicking on the “New” icon in the User variables section. Go to the folder where you Java is installed. I installed the 64bit version, so the Java folder is in my C:\Programs directory. If you have installed the JDK version of Java, you will see 2 folders in the Java directory. One for JDK, and the other for JRE. Go into the JRE directory and copy the path, and add it to your system’s environmental variables. NOTE: do not use the path to the “bin” folder as this will cause JVM errors when launching SparkR. Since I have installed winutils in my C:\Apps directory, I will copy the path from there. I will reference the path of the master folder. The SPARKR_DRIVER_R environmental variable I tripped over on my work’s hadoop system when I was looking for something else. I noticed their SPARKR_DRIVER_R was set to their R home directory. You can find your R home directory with the command below in your R console. Note, R may give you a path with a tidla, but if you paste it into a folder browser you can get the full path. Exampe, C://Apps//R//R-34~1.3 means C:\Apps\R\R-3.4.3. As you can see, my R is installed in my C:\Apps folder. 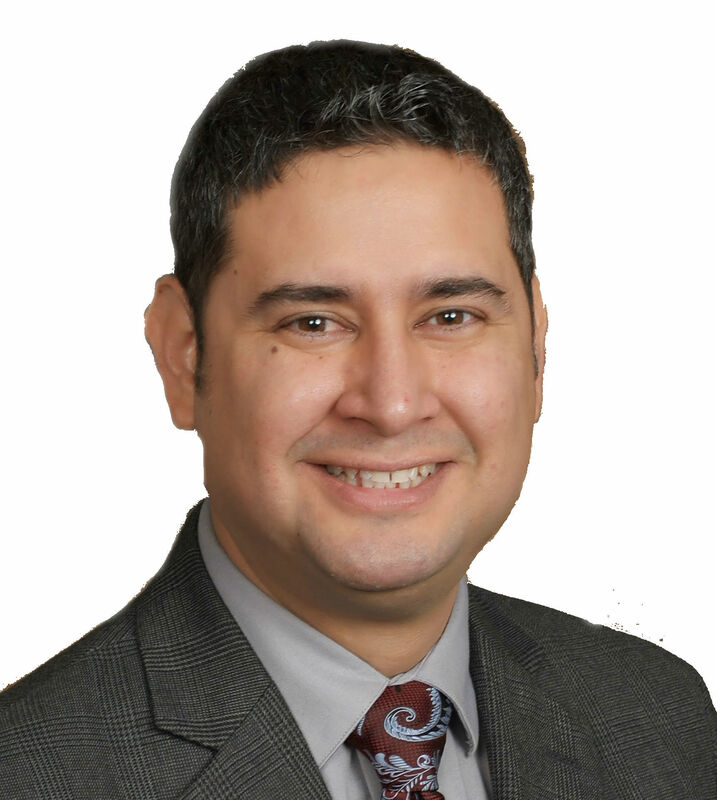 Sys.getenv("R_HOME") - Value for the R_HOME environmental variables. Now that you have everything set up you will have to restart your R and RStudio, meaning close out and open back up, so that they pick up the changes made to the environmental variables. 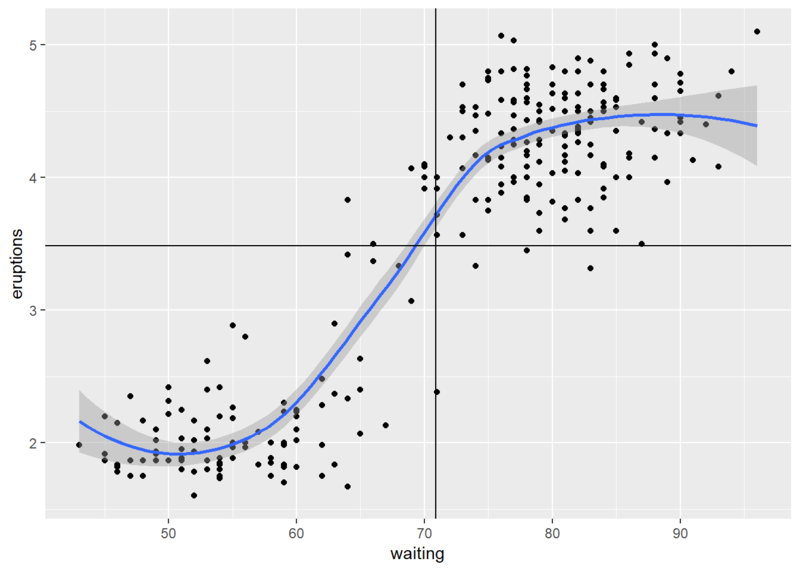 First run Sys.getenv() in R or RStudio after restarting to ensure the environmental variables are set as stated above in you R session. If not go back and figure out what you missed. I am going to load the tidyverse package to drive a point. The Spark package masks many functions in the tidyverse universe, so it matters how you call a function. When using SparkR along side other R packages, I recommend using the double colon to call your functions, at least SparkR functions with common names. For example, instead of sql(), use SparkR::sql(). This is one way to load your SparkR packages. Notice all the packages that are masked by SparkR. This version of code is commonly used in the SparkR documentation. Use the code that best suites your style of coding, there is no right way. Now that you have the SparkR package loaded, you can create a spark session on you local machine. There are 4 options below that are mandatory. enableHiveSupport - must be set to FALSE if you are running on local with no HIVE, otherwise Spark errors out trying to fine the HIVE warehouse. If you are running this on a Jupyter notebook on a Hadoop system with HIVE, this should be TRUE. master - must be set to local “local[*]” or to “local[K]” to be used by Spark. This [*] option uses the maximum cores available on your machine, while K you set the number of cores for Spark to use. On hadoop this will be “YARN” or some other configuration depending on your system build. sparkHome - field also took me a long time to figure out. I came across it on some blog a while ago, so I can’t give them credit, but that was a big win. Provide the path to your Spark home directory to this field. This may not have to be done on a Hadoop system. spark.sql.warehouse.dir - in the options list was also a big headache. The way I resolved this was trial and error, copy and pasting what other people were doing to see if it would get me past the errors messages. sparkHome = Sys.getenv("SPARK_HOME") , # this was the missing link!! If you get a “Java ref type…” you have a Spark session up and running. All the other settings are optional from what I found, such as the spark.driver.memory because they come with initial defaults. For example, the spark.driver.memory is defaulted to 1g. Paste the url provided below in a new browser tab to look at the Spark session running on your machine. You will able to see a history of the Spark jobs you submit on this site. Sometimes you get an IP address, 172.16.0.200:4040, and sometimes you get a blob such as http://LAPTOP-OK0GO9H7:4040. If you do get a blob, go to your cmd(command line) and type in “ipconfig /all” (source) to get the IP address to your local host. There you will find the IP4v address, add the :4040 or :4041 to end and paste into your browser. In any case, you should see the Spark Application UI (see below). Load the faithful data into Spark. Notice that the data frame type is “SparkDataFrame,” meaning that this data set is distributed and some regular R commands will not be able to handle this object type. Create a volatile table in Spark memory so that you can reference the data frame with Spark SQL. The scatter plot of faithful data shows a clear distinction between 2 clusters, which is not discernable from the correlation of .90. The moral of the story if you have to wait past 1 hour for old faithful to erupt, then there is a good chance you will have to wait an additional 10 to 30 minutes, but you will only gain 2 minutes of eruption time on average. If you are interested in learning and using Spark, you should be able to do that now on any PC or laptop without the need of an entire Hadoop cluster. 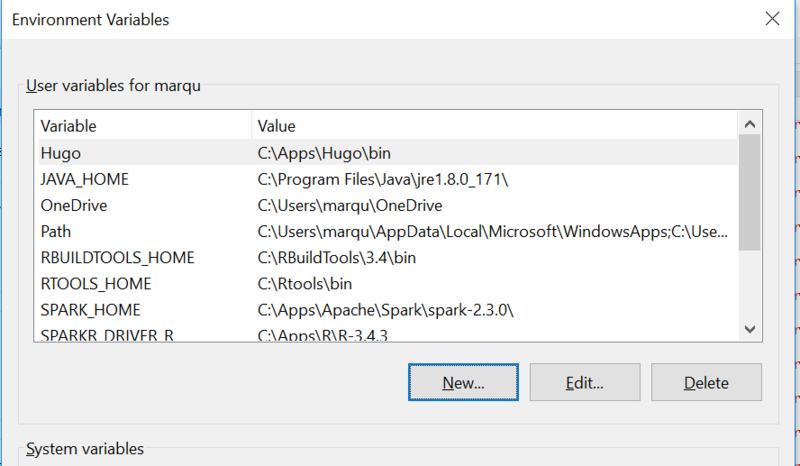 This blog covered the minimum software download and installation instructions to get you up and running with Spark and SparkR. Finally, I provided a simple example to show that the SparkR installation is working. If you would like to learn more about Spark and SparkR look up the references below. ask your employer for access or adoption…awesome resource.